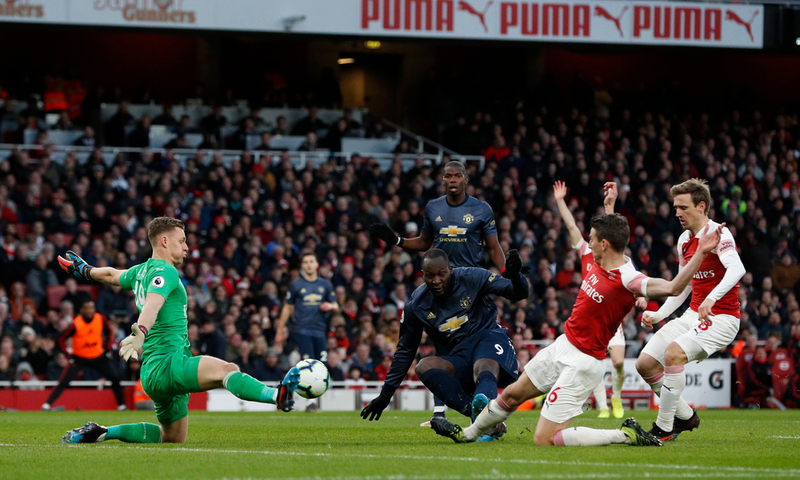 Arsenal goalkeeper Bernd Leno says Jesse Lingard’s previous antics at the Emirates Stadium helped inspire his team’s 2-0 victory over Manchester United in the Premier League on Sunday afternoon. Leno kept a clean sheet - his third in his last five home games in the Premier League - to help Arsenal to a ninth straight home win and rise up to fourth in the top flight, moving two points above their opponents in the process. Goals from Granit Xhaka and Pierre-Emerick Aubameyang either side of half-time respectively sealed what could well prove to be a vital result for Unai Emery’s team come the end of the season, with the Gunners also now sitting just a point behind Tottenham in the table. The last time United visited the Emirates came back in January in the FA Cup, as Ole Gunnar Solskjaer’s side sealed a 3-1 victory away from home, during which Lingard scored his team’s second goal of the game. The 26-year-old celebrated that strike with a moonwalk, just one season after he netted at the Emirates and performed the Milly Rock dance in front of the away fans, with some fans since branding it the ‘Jesse Lingard Stadium’. Lingard was absent for Sunday’s game, but Leno’s comments confirmed that he was at the forefront of Arsenal minds heading into kick-off. "In your mind you will never forget something like that, when somebody is celebrating," he said. The race for the top four has now become one of the most fascinating storylines in the Premier League, with four sides competing for the remaining two places behind Manchester City and Liverpool. Spurs remain in pole position with 61 points from 30 games, though both Arsenal and Manchester United are now both within touching distance on 60 and 58 points respectively. As for Chelsea, they are sat on 57 points after dropping points at home to Wolves, but have a game in hand on all sides above them.